This article tells about basics for NoSQL database management systems and provide information about best usable NoSQL DBMS i.e. MongoDB.This also have information about the fact that whyb we require any NoSQL DBMS and how we can use them in our application development. It also provide knowledge about GUI tool to use MongoDB. In this blog post we will understand how to use MongoDB as backend service for our application development. MongoDB is a NoSQL (i.e. non-relational) database. It is an open source DBMS which stores data in form of documents with JSON format. NoSQL databases provides high performance, scalability in comparison to any RDBMS (Relational database management system) when we have to deal with unstructured data in our application. MongoDB is one of the popular NoSQL DBMS in comparison to others. It stores data inside documents (Objects) in form of JOSN format which makes faster performance and easily deal with datatypes of any programming language. MongoDB is beneficial as it provides some features same as any RDBMS like indexing, replication, sharding etc. In such way we can leverage the dual benefits as we are able to use features which we used to have with RDBMS with the other benefits of non-relational databases as well. •	To store real time data like: sensor based applications' data. •	To store large amount of unstructured data in form of documents. •	To maintain/archive old blog post data. •	To maintain large amount of "Product catalog/Inventory" data, this is not relational in nature. Hence it is best to use NoSQL DB for this purpose. •	Real time based applications. •	To store comments from users for an e-commerce site. This is very easy process to install, configure and use MongoDB. http://mongodb.org/ and download Mongo. While downloading it, make sure we choose correct version for windows (i.e. download should fit our system configuration, as for Windows 8 on a 64 bit processor we want "64 bit 2008 R2+"). This will provide msi file which we need to install. 5. In the folder created above we need to create a folder "data" and inside data folder create another folder "db". 7. To create service, run the command prompt as "Run as administrator". Go to the path to bin folder of MongoDB in our system (i.e. C:\Program Files\MongoDB). sc.exe create MongoDB binPath= "C:\Program Files\MongoDB\Server\3.0\bin\mongod.exe --service --config=\"D:\MongoDB\mongod.cfg\"" DisplayName= "MongoDB" start= "auto"
After this MongoDB is up and running on our system as a service. 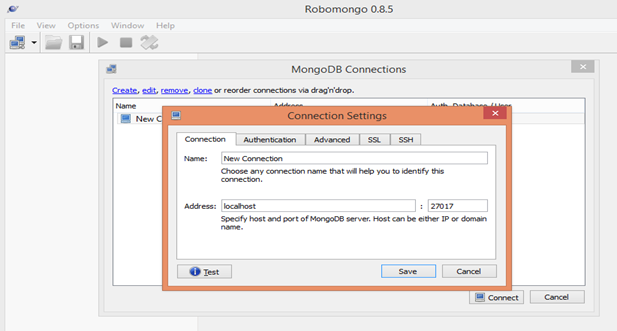 To easily use mongoDB we have GUI tool available. 1. We need to install this tool into our system. 2. 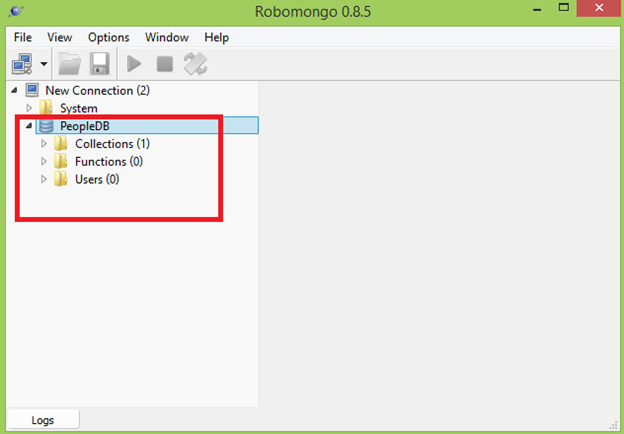 Start robomongo tool and try to configure database. Inside MongoDB connection wizard click "create" link to establish connection. 3. Here we can create connection to server by providing user authentication details inside "Authentication" tab and can provide default database name inside "Advanced" tab. 4. After connecting to database server, we need to create our database. Right click on "New Connection" and select "Create Database". 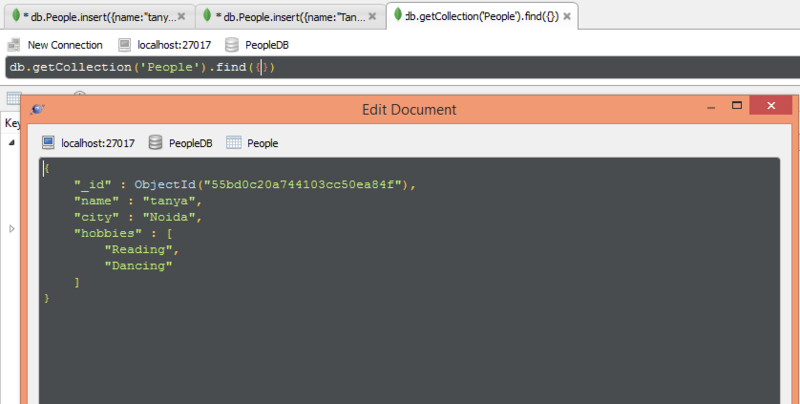 Provide name to DB for example: "PeopleDB"
5. This step create empty database and we have to then create collection, by right clicking on collections and select "Create Collection". Provide name for example: "People". Note: For RDBMS folks it can be think of as a table. 6. To get any data from collection we need to double click on collection name. 7. Now we need to insert some data to our People collection. By double clicking on it we can find shell script open at right side of window. 8. We need to write insert command there and press run. This will insert 1 record in our DB. 9. Double click on collection and see newly added data. 10. 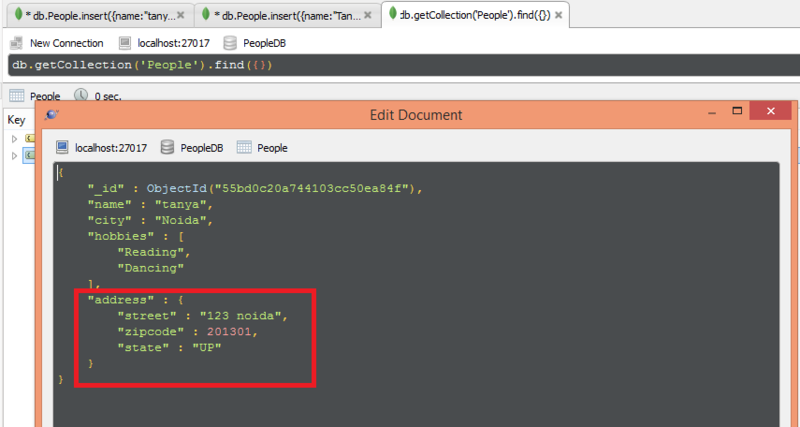 Here notice one additional field that has been added is _id and every document in MongoDB contains this id by default. We can have our own as well. 11. Now I am going to add one more record. As MongoDB is schema less so we can provide more information also. 12. Here notice power of MongoDB, as if we have to add some information to our table then we have to either add new column for that or create some other relational table but here we can easily add such data to document(as we don't need to respect schema). 13. One more benefit of this tool is we can easily edit/ add data by right clicking on any document (record) and select "Edit document". 14. 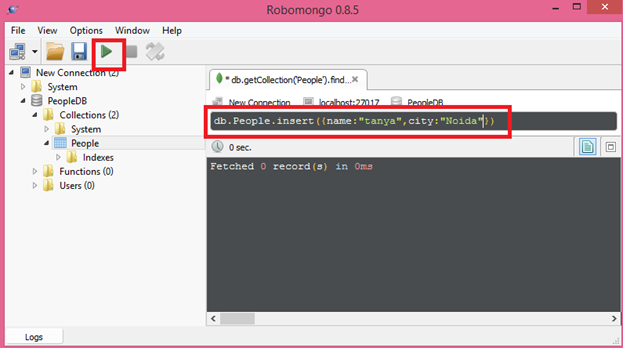 Using mongoDB, we can have nested documents (i.e. document inside another document). This solves our problem as in SQL we had to create another table for this purpose. 15. This was the insertion of data. Now we have to query this inserted data. For example: If I have to find data with name: Tanya, I have to provide this condition inside find function. 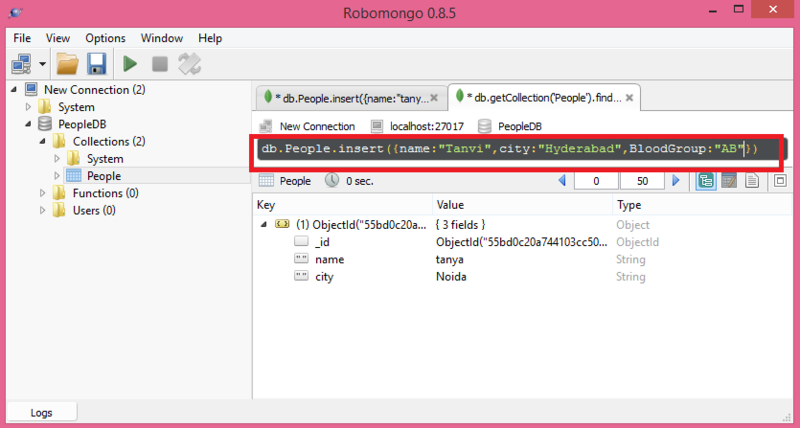 So in this article we understood what MongoDB is, why we should use it and how we can start using it by GUI tool and how can we store data into it and query that data. Please stay tuned for more information about how we can use MongoDB from C# application using C# driver.